The simplest is a single word, which for me is "sideways." It wasn't really real estate bubbles, nor babies. Banks are where sideways comes from. What is Japanification? There are all sorts of ways to explain what the term can mean. The simplest is a single word, which for me is "sideways." We live in a non-linear world, meaning one where compounding is the biggest factor. Albert Einstein probably never said compound interest is the most powerful force in the universe, but the reason the saying has stuck and has been almost universally attributed to him is the magnitude of the truth behind it. Rate of change is everything. If things are going as they should (progress, that is), on a graph it is the beautiful geometric growth curve. Even a constant rate of change leaves only this impression. Inflation, believe it or not, relates to that rate of change rather than absolute terms. Millionaires become billionaires become trillionaires because that's the way the world works now that the modern Renaissance human has overcome starvation and frequent (enough) plagues. He has also become so wealthy and progressed so far that people have stopped having babies, at least at the same rate as his recent ancestors. There aren't simple reasons for these demographic changes, but we are left to wonder which comes first; does the modern, wealthy society produce fewer offspring; or does a malfunctioning modern economy leave workers so much of an uncertain future by which they contemplate essentially the same thing? Since the late 1990s, the growth in Japan's real GDP per head has outperformed every other major economy. And unlike other major economies, income inequality in Japan has not increased, remaining amongst the lowest in the developed world. GDP growth figures flatter America's relative performance, because its population is rising much faster, by 1% a year, thanks to immigration and a higher birth rate. In contrast, the number of Japanese citizens has been shrinking since 2005. Once you take account of this, Japan's GDP per head increased at an annual rate of 2.1% in the five years to 2007, slightly faster than America's 1.9% and much better than Germany's 1.4%. In other words, contrary to the popular pessimism about Japan's economy, it has actually enjoyed the biggest gain in average income among the big three rich economies. 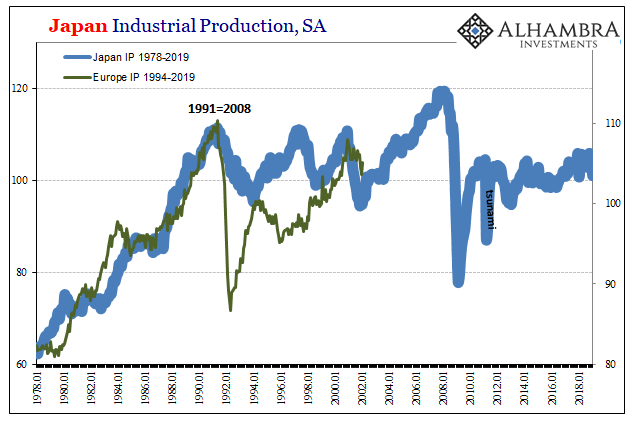 In other words, if we don't account for Japan's crash, and so long as things look like they are somewhat growing again, its post-crisis malaise isn't really that bad! No one should puzzle over lost decades, if we color it just enough perhaps it can be sold widely as minimally acceptable. Stop looking for economic mysteries, there aren't any to solve! Never does anyone account for these very clear swings up and down, the ultimate nature of which is getting nowhere. Sideways. That's the point. An economy that is caught up in this worst case is one which is susceptible to only these swings. 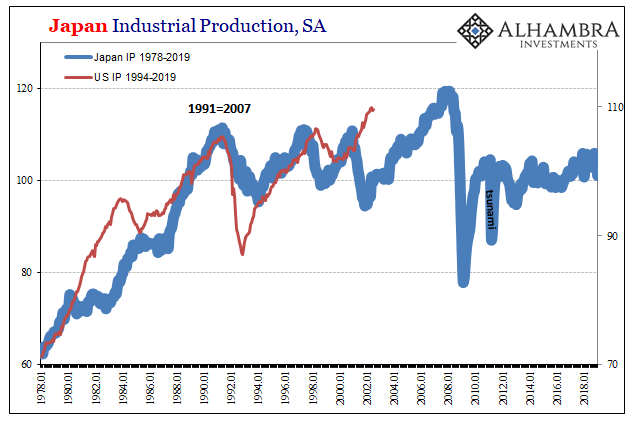 According to its Ministry of Economy, Trade, and Industry, total Japanese Industrial Production in January 2019 was 9.3% less than it was in May 1991. Twenty-eight years in between, and nearly 10% shrunk. That's not demographics; it cannot be population factors that account for all of the facts. This isn't doing pretty well, either. We don't need information about crude birth rates or the like, we can plainly see when what went wrong went wrong - 1991. It wasn't merely a real estate bubble which burst, it was the unleashing of "zombie banks", the personified malfeasance of a credit-based system which the central bank, overactive as it would become, could never, ever surmount. 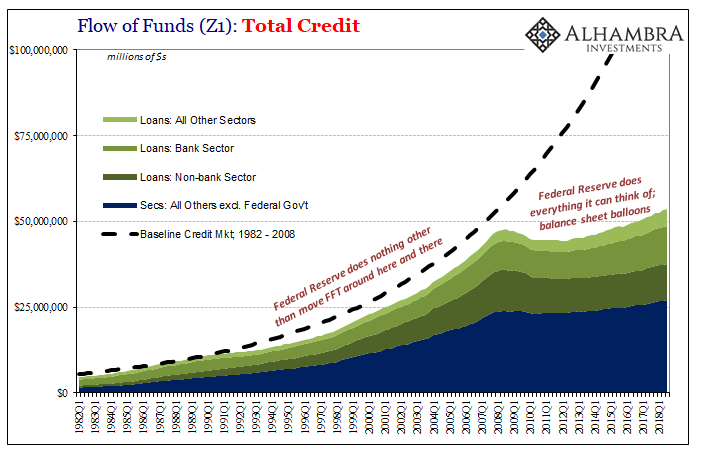 ZIRP, QEs, QQEs, YCCs, all the rest, none of them have changed anything, sideways still prevails. Thus, the desire to explain sideways in an official way that doesn't look at official policy responses. We are left to far more honestly consider instead whether sideways causes so much uncertainty that it can lead workers to rethink family and society. Economic insecurity seems almost quaint by modern comparison. A hundred years ago or less, unemployment or wage cuts meant absolute destitution. But it wasn't a permanent feature. Economic growth followed Friedman's plucking model, the V-shape to each cycle. The geometric growth curve was never abandoned and deviations from it lasted no longer than a year or two. This is visible even on Japan's IP chart (above), the couple of (nasty) recessions during the eighties only transitory disturbances in an otherwise solid trend. It was only 1990 that everything changed. This includes Japan's labor condition. Birth rates had slowed dramatically in the seventies as Japan Inc., everyone believed, was poised to dominate global trade. 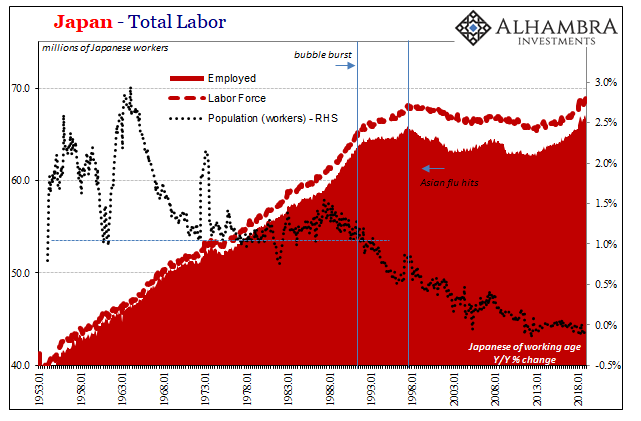 It wasn't until after 1991 that (worker) population growth finally slowed below its postwar "floor", and it wasn't until after Japan's experience with the Asian flu that worker participation dropped so low (in a way we now easily recognize). A counterfactual is always hard to argue. Given modern experience, though, even a small Japanese baby boom might not have been so hard to imagine during the nineties as Japan Inc. could've been resurrected from its ashes. By focusing instead on population, and using that as an excuse to rethink Japanification, it might be that those making the argument are actually missing the big picture. Japan's post-1990s economy can seem OK when you look at it from the standpoint of demographics, which obscures the more obvious truth that Japan's economy is not OK, forcing you to defer to demographics to reach a reduced standard for interpretation. 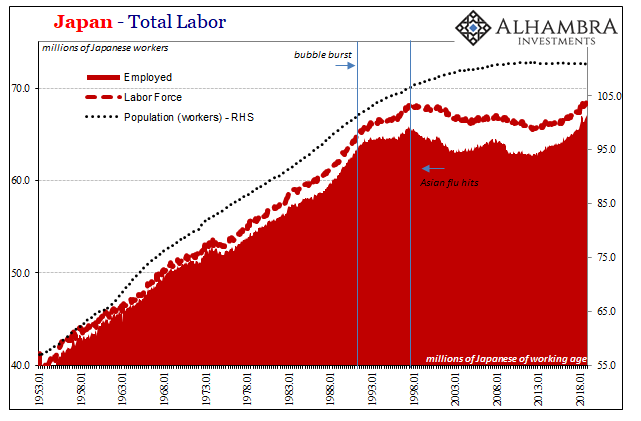 Japan's population track didn't reach any sort of critical moment around 1991, but Japan's monetary system sure did. Thus, we shouldn't focus on trying to make the aftermath seem OK when the whole thing really comes down to what happened in 1990. Population changes cannot account for the 1990s. The banking system's constant failure, the one lost decade, sure had an impact on what followed in the 21st century. 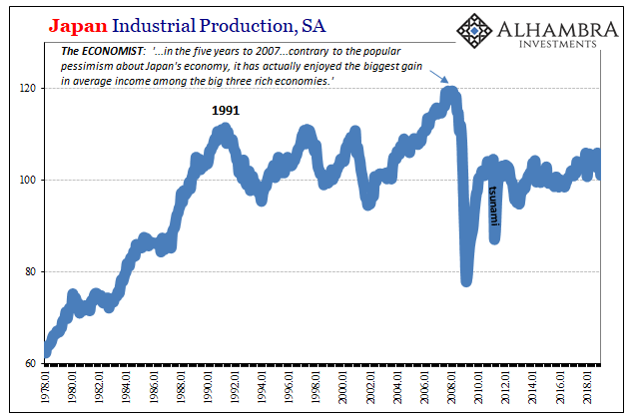 You can't argue that if we ignore the nineties Japan's economy in the 2000s has been "good enough." They are saying you should stop looking for real growth, there weren't enough babies for Japan to have done any better. We should all stop looking for better growth, the world is following Japan. Economic growth is not population growth. At least it wasn't until something took the first part away. In Japan, that was 1990. The rest of the world, 2007. It wasn't really real estate bubbles, nor babies. Banks are where sideways comes from.